WASHINGTON (Oct. 13, 2010) -- The Army exceeded its recruiting goals again this year, turning more than 74,577 young Americans into Soldiers in fiscal year 2010. That's about 77 more Soldiers than it planned to recruit. During a press conference Oct. 12 at the Pentagon, Maj. Gen. Donald M. Campbell Jr., commander of the U. S. Army Recruiting Command, discussed the Army's recruiting efforts last year and its successes. 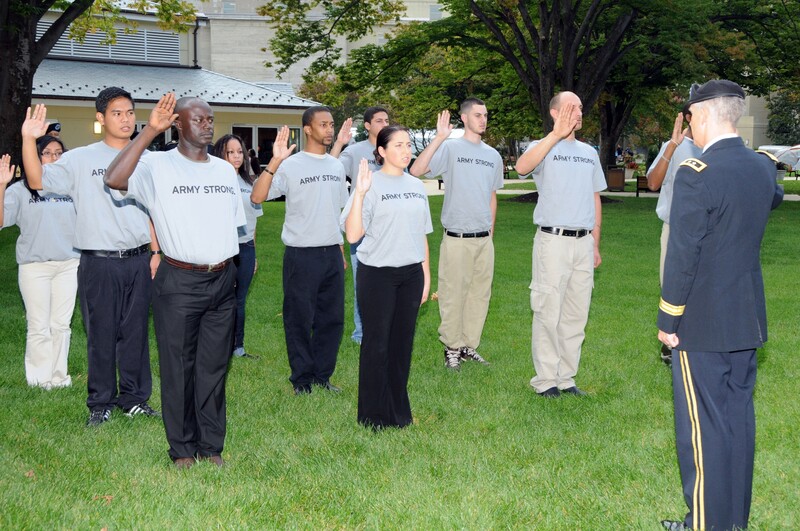 Maj. Gen. Donald M. Campbell Jr., commander of the U. S. Army Recruiting Command, administers the oath of enlistment to Army recruits in the courtyard of the Pentagon, Oct. 12. It wasn't only numbers the Army's recruiters could pride themselves on, it's also recruit quality. In FY 2010, for instance, about 99.9 percent of recruits had high school diplomas -- only a handful came in with a grade equivalency degree, known as a GED. And of all Army recruits, 64 percent scored at or above the 50th percentile on the Armed Forces Qualification Test. The Department of Defense requires only 60 percent of recruits meet that mark. Across the board, the military services, including the Army, brought in a diverse set of new recruits that looks like America looks -- matching recruiting numbers for major ethnic groups to within just points of what the larger American population of 18-to-24-year-olds look like. In 2009, for instance, 71.4 percent of non-prior-service recruits were white, 15.4 percent were African American, and 15.8 percent identified as Hispanic. Those numbers come close to the percentages of the American population of 77.7 percent, 14.7 percent, and 17.9 percent respectively. "My job is to make sure we look like America -- that we are a diverse organization that supports America," Campbell said. "We watch very carefully the numbers that we recruit in all the major ethnic categories, and make sure we look like America." The latest pool of recruits doesn't just span ethnic and racial boundaries. They also come from a variety of economic backgrounds, Campbell said. Numbers showing family income from recruits show that nearly two-thirds of recruits come from middle-class or higher backgrounds. Nearly 25 percent of recruits come from the "richest quintile," according to one set of DOD numbers. "(It's a) fallacy that we recruit from the poorest of Americans," Campbell said. "Those numbers bear it out. If you look at the numbers, we essentially recruit from the middle class to the upper middle class to the richest." The success of the most recent recruiting effort, Campbell said, can be attributed to the Army's recruiting teams. "We have a great team in the field, both noncommissioned officers and officers," he said. "But, primarily, the noncommissioned officers." Campbell said the Army is transitioning away now from an older recruiting model where the mission is laid on individuals and is instead moving toward an effort where it's a team that produces recruiting successes. "We're really working hard on moving this from what we call a legacy individual-based recruiting method to more of a team concept," he said. "I believe the team concept is starting to catch on." Historically, he said, recruiting missions would come from the highest levels to the lowest person. "We'd tell you, here's your mission, go sign for it." Now, he said, missions are assigned to a station and the station commander decides how he's going to attack the mission. "It's not on one person's shoulders in the station or two, it's on the team," Campbell said. The general also said recruiting teams break up missions into distinct tasks as well, which allows Soldier recruiters to spend more time talking with recruits and less time doing processing paperwork. Campbell acknowledged that the current job market and economic crisis might have contributed some to the successes of the Army's last recruiting year, but said that historically, the economy has not been a good predictor of recruiting successes. "There is some credence to the economy helps us," he said. "But there's historical data that shows that similar economic downturns have not yielded the same number of quality recruits." The general said he thinks two things are driving good recruiting numbers. First, recruits want to serve, and second, they are after adventure. "They want opportunities for adventure and a lot of the military occupational specialties we have in the Army -- the 150 'ways to be a Soldier' -- provide them opportunity for adventure," he said. Challenges in the future for Army recruiting include the continued low percentage of Americans that are even qualified to join military service. Factors that could preclude a potential recruit from becoming a Soldier include medical, educational or conduct issues. "As you look to the future, I think one thing will remain constant," Campbell said. "If you look at 17-24-year olds -- for all of our services -- only about three in 10 of those young men and women are going to be qualified to serve." He also said an improved economy, and more job opportunities in the market, could have some impact on recruiting. "As the economy turns, our business will get a little tougher, but if we set the conditions now in the Army, like we are trying to do and focus on quality of life, taking care of Soldiers and families, and focus on those tools that allow them to recruit in difficult environments, then we will be okay," he said. Following the press briefing, Campbell stepped outside to the Pentagon courtyard to meet with some of the young Americans who had decided to join the Army, and to administer the oath of enlistment to them. Gabriella Marvin, originally from New Jersey, but who attends school in Washington, D.C., was one of those recruits. "Being a history major I've come to love my country," Marvin said. "I've worked for different parts of the government before. I worked for a congressman." Joining the Army is something she said she's wanted to do for a while. "It's just different," she said. "I could have gone and gotten a job on Capitol Hill with no problem." She will ship off to basic training in February, she said, but not before finishing her history degree at George Washington University. In the Army, she'll be a military police officer. She said she's concerned about being deployed, but that she knew about that before enlisting. "I think anybody would be worried, but it's part of the job and it's a risk I'm willing to take -- that I knew about before I signed my contract," she said. "I'm more worried that my mother's worried. But she told me it'd probably be good for me because I'm a little bit of a slob. Reid Reifschlager, originally from Texas, was also in the Pentagon courtyard and raised his hand for the oath of enlistment. "It's something I've wanted to do ever since I was 11," he said. "After working dead-end jobs and not really pushing myself to do it, I had this opportunity to move up here with my sister." He said his sister was forceful in helping him get his life together and helped him make some positive decisions about his life. "She said 'yo, let's get this done,'" he said. "And I was like, it's about time. I've wanted to do this for about nine years -- why don't I go ahead and do it." Reifschlager said he was just 11 when he decided he really wanted to be a Soldier -- right around the terrorist attacks of Sept. 11, 2001. "It's kind of coincidental," he said. "I wanted to be one of the people that help serve and fight for my country." In the Army, Reifschlager will serve as an infantry Soldier. He signed up for a four-year contract and says he hopes to eventually re-enlist and retrain in combat engineering. "I could have gone to college," he said. "But I would have struggled in school. School's not really my thing." But he did say that he's seen his friends who've joined the military come back -- more mature. "They're a different person from where they were before," he said. "Most of the time for the better. I hope I get that change." Next year's Army recruiting effort, Campbell said, is already underway. The command actually has about half its job complete. Next year's target, Campbell said, is 67,000 Soldiers. "We're going to do it, because we've started this year with an entry pool of 33,276 -- almost 50 percent of the requirement for the next year is already signed up with us," he said. "We are positioned well, we have the right number of NCOs, and I am funded to the levels we need."